Dear navigator: You have just arrived at the website of the Spanish Navy, an institution that groups together more than 25,000 men and women with state-of-the-art assets. With this page we want you to have the opportunity to get to know it better in a direct and straightforward manner. Our website covers a wide variety of aspects. Among other things, the Spanish Navy organisation; its ships and units currently in service and those in project for the near future; you will be able to approach our ships at sea and be acquainted with our sailors and their professional perspectives; or you can also visit our Naval Museum "virtually", or learn about some interesting marine curiosities. 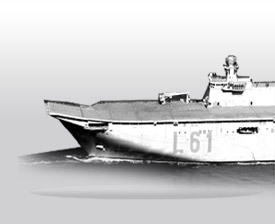 I trust this website may be of interest to you, and that many people get to know the Spanish Navy better, discovering its attractive nature. We are going to show it just as it is, and we are open to any suggestions aimed at improving its contents. I hope you feel comfortable "navigating" with us. Admiral General Teodoro López Calderón.